The Maslow motivation theory has become the bedrock from which most other theories stem. . . . Various other theories addressing human motivation from many other psychological viewpoints exists, each placing another individual perspective on the same theme. The theory formulates a framework on which the basic human needs are placed in order of precedence. Most theories before Maslow focused on the theoretical although he claims to have placed his attention on the practical. 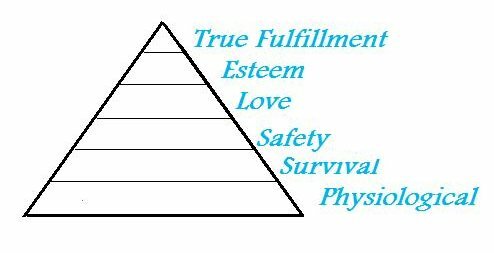 The bed rock of the Maslow motivation theory is his Hierarchy of Needs. This speculates that an individual is first motivated by the unsatisfied requirements in his life. High potentials are beyond his reach until these basic, more urgent needs are satisfied. He sets out, an order of priority, a framework on which his Hierarchy of Needs is based. Normally, set out graphically as a pyramid indicating the various levels to achievement. He claims that each individual level or stage must be satisfied before an individual is psychologically able to achieve greater self-actualization. Maslow referred to these as ‘deficiency needs.’ They are essential areas that, unless satisfied, prevented the people functioning at their full potential. Each level must be satisfied, from the bottom up, before the individual can unselfishly reach his potential. This is the Maslow motivation theory. A needs triangle . . . a framework of motivation based on his clinical or material experiences. ‘Clinical experiences can change when the human physical reality is considered, but that is another subject.